Over the years, DC has released a number of stories that pertain to presidential elections. The best known of these would likely be Lex 2000, which saw the US elect a criminal demagogue who allowed a deadly attack to occur on US soil so that he could lead the country in a war. Amazing how unlike reality fiction can be. I also have found memories of a four part tale that ran in The Demon back in the 90s, when Etrigan became the candidate for the right wing. 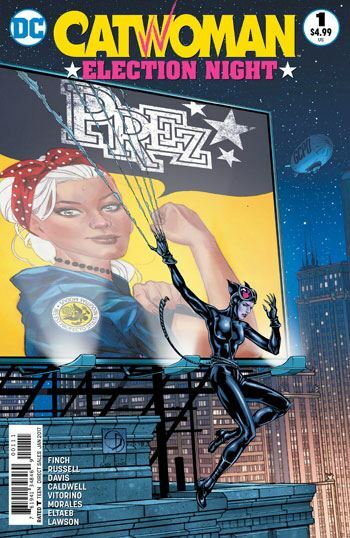 Considering that the current election going on is possibly the most vicious and divisive since their Civil War, I had high hopes for a twisting tale of corruption and deceit, with Catwoman toying with both contenders for the Oval Office. If that is what you are hoping for as well, from the Catwoman: Election Night special, it’s probably best if you save your money. On the surface, there are some points of similarity. The Penguin is one of the people running, and the speeches he is given have some Trumpiness to their incoherence and rhetoric. And he wants to build a wall, which is central to the overall plot. His opponent is a woman who is apparently pure as the driven snow. But she proves to have some deadly dark skeletons in her closet as well. To be frank, had this not been released just prior to the election, and instead had come out as part of a regular, ongoing Catwoman series, I would probably have a higher view of the tale. The art is exceptional. A lot of the dialogue is really crisp. We get some good background on Selina’s life in the orphanage. The Batman/Catwoman scene is very well written. There really is a lot to like about the story, in and of itself. But as any sort of commentary on the electoral disaster playing out in the media, this falls very flat. The back-up story is much more entertaining, seeing the return of Prez. Poor Prez, the first series, from the 70s, lasted only a few issues, and the more recent incarnation saw her miniseries cancelled part way through the run. I really like this new Prez, which contains far better political commentary. This is where the meat of the issue lies, as Prez has to deal with gun-hat wearing white men who want to increase the degree of regulation they have over women’s reproductive systems. It’s a dark and twisted, but hugely entertaining, back-up story that completely outshines the lead tale. In fact, to be honest, when I sat down to write this review I realized I had to look back over the Catwoman story to remember what had happened. The Prez back-up had all but deleted it. So while I cannot recommend this book for what it claims to be, I would say it’s a must read for any of those crushed by the cancellation of Prez.